Contain more antioxidants than blueberries. Antioxidants fight off free radicals (atoms with unpaired electrons) in the body. When electrons are unpaired they are unstable and wreak havoc in the body causing DNA damage and can lead to cell death and cancer. This is why you need antioxidants to protect from these radical cells! Are a great source of omega 3s. Omega 3s are essential for good health and since your body is unable to make them on it's own you have to get them through diet. Omegas control blood clotting, build cell membranes in the brain, and they help protect against heart disease, cancer and autoimmune diseases such as lupus and rheumatoid arthritis. Can be eaten so many different ways!! Chia pudding, thrown in smoothies & oatmeal, sprinkled on top of toast, ice cream, cereal, whatever your little heart desires. You can even throw them in juice and wait for them to gel up! I am going to give you my recipe for my personal favorite way to eat them- PUDDING! Cause it tastes like dessert, but it's healthy!! Did I mention how easy it is to make?! It takes all of less than 5 minutes! Also, my way doesn't contain any refined sugars, only natural sugars from fruit so you can totally eat it for breakfast and not feel an ounce of guilt about it. DESSERT FOR BREAKFAST! Yes please. Note: You can make this same recipe a thousand different ways with different ingredients. Feel to experiment around with them! Chocolate and Peanut Butter are personal favs of mine to throw in there. Blend the almond milk, dates, banana, cinnamon, vanilla and pink salt very well. Throw the chia seeds in a bowl and pour the blended mixture over them and stir until they are fully immersed in the liquid. Let it sit in the fridge for at least 2 hours, but feel free to leave it overnight in the fridge. Chia seeds, when immersed in liquid, form a little gel over their seed that has a tapioca like texture to it. Voila, PUDDING! 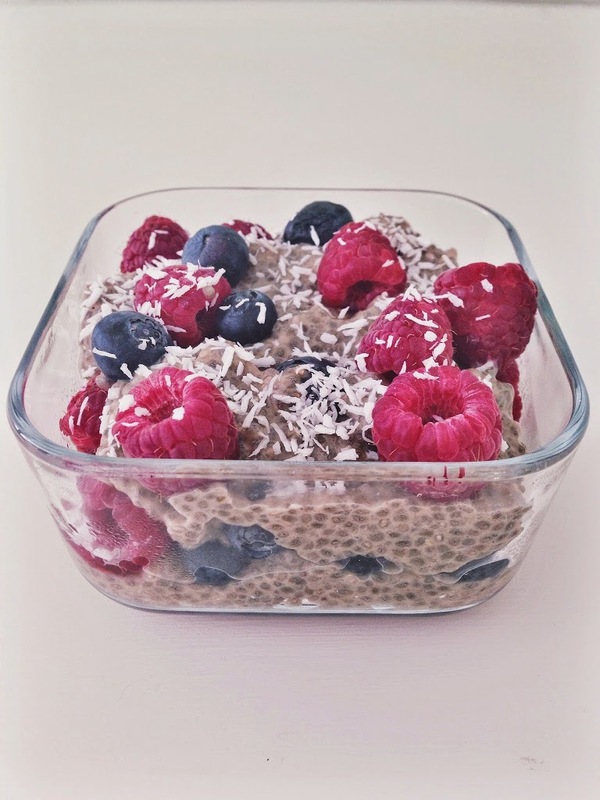 Top with anything you’d like: dark chocolate chips, cacao nibs, shredded coconut, berries, or just enjoy it plain!